Wakefield Comics-616019224 375234work ShopWakefield Comics-616 is your gateway to a multiverse of Pop Culture. At Wakefield Comics-616 you will find all your favourite Comic Book and Movie characters all under one roof. From the Avengers to the Justice League, Doctor Who to Dragonball Z, and many more. Set up a subscription so you don't miss the latest comics from America or pre-order a Graphic Novel, buy a Vinyl toy or browse our Anime and Manga sections. If its not in stock ask and we'll do our best to get you it. Come see our wall of characters and see how many you know or just pop in for a chat with ex-voice actor and film director James who will be happy to help you. 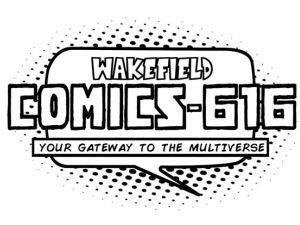 Wakefield Comics-616 is a shop for the fans and only with your support can we continue to be a shop for the fans. 10:00AM - 4:00PM Monday, Tuesday, Thursday, & Friday. 10:00AM - 4:30PM Wednesday & Saturday. Located at 3 The Springs, opposite Cafe 19 in the City Centre.